We’ve caved to popular demand and have launched two new t-shirt designs: Che Stallman and Bruce Schneier. We’ve also got stickers of these, and the Knuth design. These are all currently (26/03/07) on pre-order, so please be patient waiting for delivery. Thanks! ELER and Donald Knuth t-shirts: Cheaper (but slower) delivery option now too! Yeah, I’m sure ESR would love to have Ian Murdock’s gig at Sun; the guy badly needs someone to tell him he matters. RMS? The guy spent the early days of GNU as a homeless person, sleeping in the office the MIT AI Lab gave him. He’s already got his dream job. 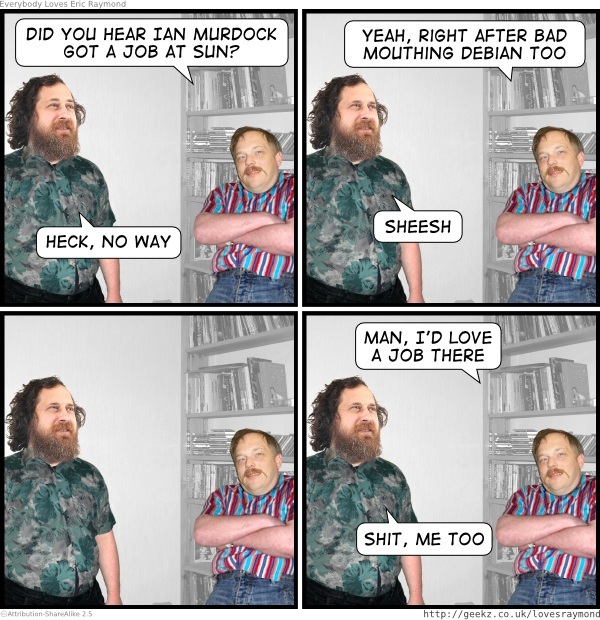 To be fair, Sun is apparently committed to becoming an entirely open-source company. Look at the recent open-sourcing of Solaris and Java. I _love_ SUN hardware. Or rather, compared to the other machines of their day, the SPARC-2 and SPARC-10 that I learned UNIX (Ok, SunOS) on were great. And I was very happy with how well Debian installed on the SPARC-2 and SPARC-20 that someone let me get my hands on few years later. What I would like to see is the SPARC chip “OpenSourced”, as in the chip and architecture released as open hardware. Like the Linux BIOS. I mean, it’s not like Sun is making any money off of that architecture any more, they seem to have gone off the Intel diving board. But then, I could be completely off base and they are actually making tons of money on SPARC-based Debian-running cluster-nodes, but I have not heard of it. Bob, did you mean like Sun already did, or more like Gaisler already did? Leeg, _thank you_! I am thrilled to know I had an idea that other people thought were good too. Now, how much for a OpenSparc with OpenBIOS? I guess I’d best go looking first so I don’t look stupid. Well, the SPARC Niagara was open sourced (GPL’d it seems). There’s also been a few OpenFirmware implementations open sourced, including Sun’s OpenBOOT. They’re available from OpenBIOS’s svn repository. Che Stallman, eh? So when does RMS plan on brutally murdering large numbers of innocent people? Uhhhhhh, RMS hasn’t murdered anybody yet, so Che Stallman is just a little inaccurate. But, hey, this site is all about LIES and MISREPRESENTATION, so why not profit from a Che Stallman shirt? Russ: that’s the free market for you. I just checked Wikipedia though, and it mentions nothing of those murders, so I guess they didn’t happen. The year is now 2010. Oracle has just had its buyover of Sun approved by the EU not a couple of months ago.